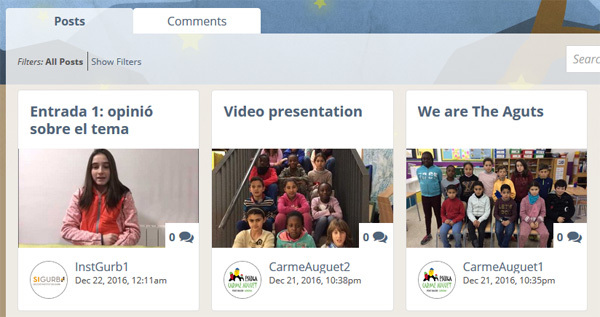 Participating children in Catalonia have already begun to share their team video-presentations and their opinions on Acces to Education through their collaborative blog. You can check it here. We think that the topic of this project [Access to Education] is very interesting. Besides it is totally appropriate for us. By carrying out this project, we have the opportunity to learn English, to practice Scratch and also to enrich ourselves when talking to our Indian colleagues. Although this project seems quite difficult for us, we feel really inspired and we are eager to start. From our point of view, the right to education is extremely important. We have learnt that this is one of the goals for sustainable development that UN wants to achieve by 2030. That would be grateful, but we think it might be difficult. One of the greatest activists who stands for this right is Malala Yousafzai, who was attacked when she was coming back from school. And here the video-presentations of children at Escola Carme Auguet and Institut de Gurb. To talk in English is a big challenge for them, but a great opportunity! Oh, they are so cute!!!! It’s really cool that you doing this for kids. I hope that it will grant them happiness. Never thought that I will be so touched by kids who barely know English. However, now I really feel it and now understand why people are putting their life to work with kids. Good job guys, keep doing what you are doing! Thank you for the hardworking! I admire your work!